Anatomical variations in the premaxillary region, especially those involving neurovascular structures, can present a diagnostic challenge to a clinician. Correct diagnosis is crucial for treatment decision-making and prognosis assessment of nonsurgical and surgical procedures. Canalis sinuosus (CS) is an anatomical variation of the anterior superior alveolar nerve canal. Its diagnosis may sometimes be confusing, resulting in an inadequate treatment plan. Described is a case of a CS mimicking an external root resorption lesion. Cone beam computed tomography (CBCT) assisted in confirming the final diagnosis. Canalis sinuosus (CS) is a neurovascular canal that carries the anterior superior alveolar nerve and vessels. This neurovascular structure was described leaving the infraorbital foramen and running laterally in a 2-mm diameter bony canal. It turns downward in the anterior wall of the antrum along the lateral wall of the nose and finally tunneling downward around the nasal opening and floor or terminating in the alveolar ridge palatally to the maxillary anterior teeth. Unaware of its presence, a clinician may confuse CS with a lesion of endodontic origin. Current cone beam computed tomography (CBCT) technology enables a three-dimensional evaluation of the anatomy of the maxilla, including the neurovascular channels. Furthermore, it discloses channels that are <1 mm in diameter that otherwise may not be visible on conventional radiographs. Presented is a case of an unusual appearance of CS mimicking an endodontic resorptive defect in a maxillary left central incisor. CBCT was used to confirm the final diagnosis. A 50-year-old Hispanic male was referred for endodontic treatment of a maxillary left central incisor. Medical history was noncontributory. Extra- and intra-oral examinations were normal. The patient reported no history of orthodontic treatment or previous trauma to the region. Clinically, the crown of the maxillary left central incisor showed discoloration and presence of an old facial and mesioincisal composite restoration. The tooth was not tender to palpation or percussion and was not sensitive upon biting. The pulp was not responsive to thermal and electric tests. Radiographically, periapical radiolucency was evident [Figure 1]. In addition, the junction of the mid-third and apical third of the root showed a well-defined, circular radiolucent area that shifted in position following change of the horizontal radiographic angulation [Figure 1]. The root canal contour could be traced without interruptions or irregularities. The horizontal bone height and density appeared normal. At this point, a tentative diagnosis of asymptomatic apical periodontitis due to pulp necrosis in the maxillary left central incisor was made. 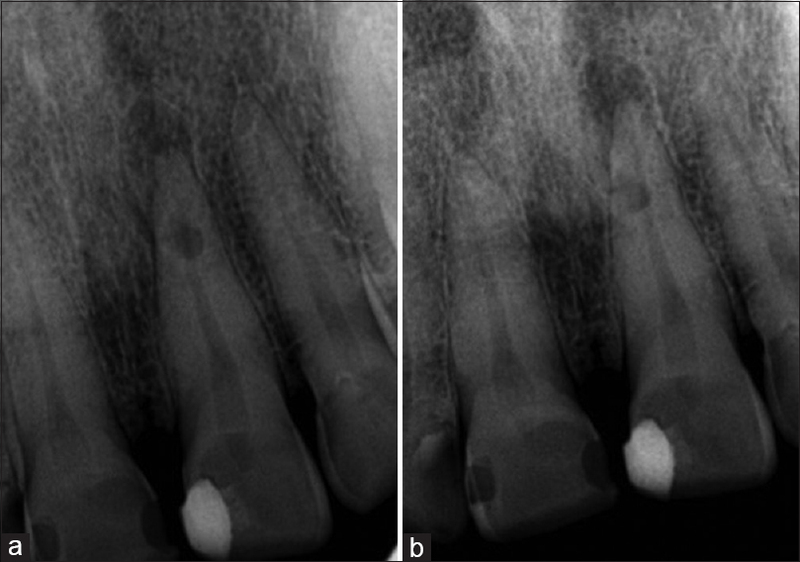 Since the pulp was nonresponsive to pulp sensitivity tests, the outline of the root canal appeared uninterrupted, and the mid-root radiolucency shifted upon changing the horizontal radiographic angulation, the defect was initially considered to be an external root resorption. A CBCT analysis was then prescribed to determine the extent of the lesion and presence of possible communications between the resorptive defect and the root canal system. CBCT analysis was done using CS 9000 extra-oral imaging system (Carestream Health, New York, USA). Axial slices of the maxillofacial region in 76 μ thickness were reviewed to determine the extent of the lesion. The CBCT analysis showed the presence of a periapical radiolucency surrounding the root apex that extended toward the palatal surface [Figure 2]. No other areas of root abnormality were noted. The mid-root radiolucency was confirmed as CS. It was evident in different sagittal and coronal views [Figure 2]. Nonsurgical endodontic treatment was completed uneventfully, and the patient was recalled after 6 months. At that time, the patient was comfortable and signs of active osseous healing were evident on both conventional and CBCT images [Figure 3]. Maxillary anterior anatomic variations may often be related to the NPC and are usually diagnosed by aid of conventional radiographs. The NPC has been described as being located in the midline of the palate, posterior to the roots of the maxillary central incisors. The oral opening of the canal is the incisive foramen located underneath the incisive papilla. The average length of the NPC is approximate 10.99 mm, and the average width of the incisive foramen is below 6 mm in diameter. However, the canal can vary significantly in length and diameter and therefore be misdiagnosed. Since the early 2000s, technological developments in CBCT and its increased use in dentistry have contributed to a better understanding of these anatomical variations and neurovascular structures. CS is a normal unilateral or bilateral anatomical structure that branches off from the infraorbital canal and carries the anterior superior alveolar nerve along with its corresponding veins and arteries. The entire course of the CS is approximately 5.5 cm in length, with the orbital floor part accounting for around 1.5 cm, the transverse facing part around 2 cm, and the circumnarial part around 2 cm. Its width is fairly constant along its whole trajectory. Statistically, no significant differences were found between genders and age groups. The current literature indicates that the incidence of these anatomic variations and accessory canals are not uncommon.,,, The incidence of one or more accessory canals in the anterior maxilla with diameters > 1 mm, other than the NPC, varied between 15.7% and 32.9%. These accessory canals can normally be found palatally to all maxillary anterior teeth, and in some instances, they communicate with the CS. Several conditions may depict periapical and mid-root radiolucency in the maxillary anterior area and cause confusion in diagnosis. Among those are granulomas, cysts,, periapical scar, ameloblastoma, aberrant salivary gland tissue, periapical cemental dysplasia, carcinoma, iatrogenic procedural errors, root resorption, and normal anatomy such as incisive foramen. These conditions should be included in the differential diagnosis process. In the case presented, the radiolucency at the junction between the mid-third and apical third of the root of the maxillary left central incisor could have been misdiagnosed as an external root resorption, leading to a more aggressive treatment with possible diagnostic surgery or an endodontic surgery to repair the defect. Care should be exercised when diagnosing the etiology of periapical and mid-root radiolucencies, and CS should not be ruled out. Warwicks R, Williams PL. Gray's anatomy. 35th edition. Edinburgh: Longman. 1973. p. 1221-2. Jones FW. The anterior superior alveolar nerve and vessels. J Anat 1930;73:583-91. Shelly AM, Rushton VE, Horner K. Canalis sinuosus mimicking a periapical inflammatory lesion. Br Dent J 1999;186:378-9. Fernandez-Alonso A, Suarez-Quintanilla JA, Muinelo-Lorenzo J, Bornstein MM, Blanco-Carrion A, Suarez-Cunqueiro MM. Three-dimensional study of nasopalatine canal morphology: A descriptive retrospective analysis using cone-beam computed tomography. Surg Radiol Anat 2014;36:895-905. Neves FS, Crusoe-Souza M, Franco LC, Caria PH, Bonfim-Almeida P, Crosoe-Rebello L. Canalis Sinuosus: a rare anatomical variation. Surg Radiol Anat 2012;34:563-6.
von Arx T, Lozanoff S, Sendi P, Bornstein MM. Assessment of bone channels other than the nasoplatine canal in the anterior maxilla using limited cone beam computed tomography. Surg Radiol Anat 2013;35:783-90. Heasman PA. Clinical anatomy of the superior alveolar nerves. Brit J Oral Maxillofac Surg 1984;22:439-47. Wanzeler AM, Marinho CG, Junior SM, Manzi FR, Tuji FM. Anatomical study of the canalis sinuosus in 100 cone beam computed tomography examinations. Oral Maxillofac Surg 2015;19:49-53.
de Oliveira-Santos C, Rubira-Bullen IR, Monteiro SA, Leon JE, Jacobs R. Neurovascular anatomical variations in the anterior palate observed on CBCT images. Clin Oral Implants Res 2013;24:1044-8. Temmerman A, Hertele S, Teughels W, Dekeyser C, Jacobs R, Quirynen M. Are panoramic images reliable in planning sinus augmentation procedure? Clin Oral Implants Res 2011;22:189-94.
de C. Machado V, Chrcanovic BR, Felippe MB, Manhaes Junior LRC, de Carvalho PSP. Assessment of accessory canals of the canalis sinuosus: A study of 1000 cone beam computed tomography examinations. Oral Maxillofac Surg 2016;45:1586-91. Sekerci AE, Cantekin K, Aydinbelge M. Cone beam computed tomographic analysis of neurovascular anatomical variation other than the nasoplatine canal in the anterior maxilla in a pediatric population. Radiol Anat Surg 2015;37:181-6. Kose E, Seckri AE, Soylu E, Nazlim S. An extremely rare anatomical variation bilateral Canalis Sinuosus and nasopalatine duct cyst and role of CBCT in diagnosis. Int J Sci Res 2014;9:361-13. Gurler G, Delilbasi C, Ogut EE, Aydin K, Sakul U. Evaluation of the morphology of the canalis sinuosus using cone-beam computed tomography in patients with maxillary impacted canines. Imaging Sci Dent 2017;47:69-74. Faitaroni LA, Bueno MR, Carvalhosa AA, Mendonca EF, Estrela C. Differential diagnosis of apical periodontitis and nasopalatine duct cyst. J Endod 2011;37:403-10. Hancock MA, Brown CE Jr, Hartman K. Orthokeratinised odontogenic cyst presenting as a periapical lesion. J Endod 1986;12:539-41. Selden HS. A suspected periapical scar: treat or not? J Endod. 2000;26:180-181. Gondak RO, Rocha AC, Neves Campos JG, Vargas PA, de Almeida OP, Lopes MA, et al. Unicystic ameloblastoma mimicking apical periodontitis: a case series. J Endod 2013;39:145-8. Andreasen JO. External root resorption: Its implication in dental traumatology, paedodontics, periodontics, orthodontics and endodontics. Int Endod J 1985;18:109-18.